The advantage of making your own pickles is that you get the benefits of probiotics, increased nutrients, and a wonderful taste. 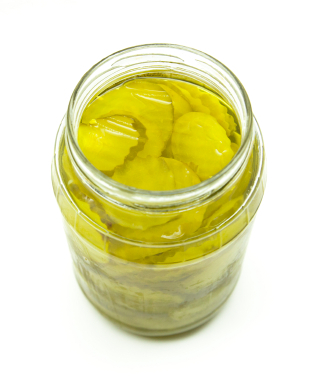 Store bought pickles are preserved with vinegar and sugar, and do not have the same health benefits. Here is an easy way to get started. What is whey and how do I get it? Whey is the watery portion of dairy that is full of probiotics and makes fermenting easy. There are a few ways to get it. The first is to leave raw milk out on the counter until it separates, about 3-4 days. Strain the liquid from the curds and keep this in a jar in the refrigerator. The faster way is to use whole organic yogurt, goat or cow. Line a strainer with cheese cloth or a thin clean dish cloth. Place the strainer in a glass bowl so that there is some room for the whey to drip. Pour the quart of yogurt in the bowl and cover for 12-24 hours. When it is done dripping, you will have cream cheese and whey. If you have a bumper crop of pickling cucumbers, you will need a large crock. Here is my favorite one.